Where to start? The game is set up early as being about the journey of two brothers across a medieval fantasy land to get a cure for their ailing father. The art direction needs to be praised, the music is appropriately elegant, and whoever handled creating the ground textures should get a raise. But what first really struck me was how the FEEL of a fairy tale Journey permeated this game. This is a Journey that stands among those of Jack (the climber and the Samurai), Frodo, and whoever had the courage to go after the fountain of life. It cannot be emphasized enough how much the sheer feeling of going on an exciting journey permeates this game. So many games feel empty in comparison, are a mechanical exercise to get through the next checkpoint or destination, with barely any soul or passion within them. Brothers had me jumping on noticeably protruding rocks on walls, shimmying on precarious ledges, handing and moving along slight fringes, and many such completely routine video game devices - but in this game as I started doing those acts I was excited, I felt like this was the start of an adventure instead of the same old typical progression towards the next level. Next, immersion. This game has no HUD or health, and it does not need them. The environmental puzzles are made to be simple and natural, quite logically embedded in the environment, so progression was almost constant and frustration almost nonexistent. This game has about 15 seconds of tutorial, as long as is required. The controls are simple, and often simply do the natural thing - keep running towards a platform to jump towards, twist the stick to turn the lever, etc. There are no points. Instead of points there are people, and places, and things to do - if you see person playing with a cat you can go over and pet it, if you see a person playing the lute you can go over and listen or mess with it slightly, if you see a fountain with fish in it you can enter and freshen up. This is what being in a world is all about. Unsurprisingly the Fares has named the designer of Ico as someone he’d like to meet, and the minimalism and design clarity here are on equal grounds with that groundbreaking game. Now, the mechanics. By having a single “interact” button and designing the game around that, the game fights against a strong bias of games for mechanistic design. By that I mean the “feel” of a platformer, a shooter, even a puzzle game - those all about the fine tuning of those specific mechanics, and the vast majority of games are designed to be enjoyable through mastering of the mechanics and variations on them over a long stretch of gameplay. 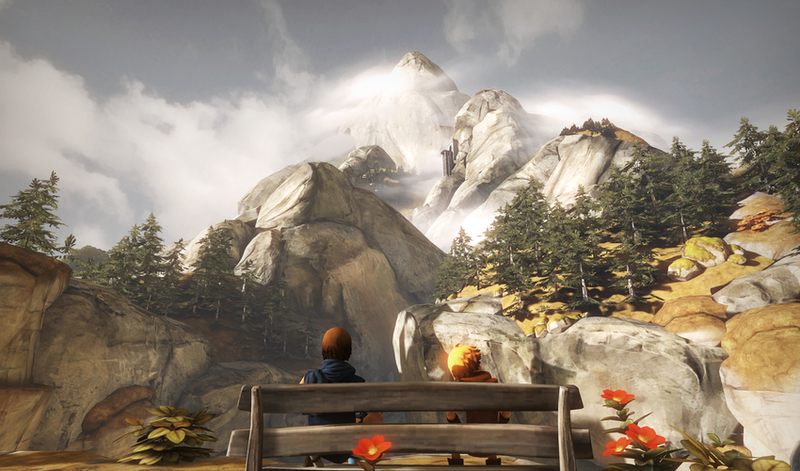 Brothers is among recent games, like Gone Home, Dear Esther, The Stanley Parable, The Novelist, and Kentucky Route Zero that lack this emphasis on the joy of the game being primarily in the mechanics, in the raw input-output experience of it. This first struck me as I was carefully avoiding piles of bones while sneaking up on a troll facing the other way to steal a key conspicuously hung on his belt - unlike so many games where just sneaking would be made into a routine mechanic, in this game the act was done once and felt good due to the narrative and emotional meaning of it rather than its mechanical execution. These game are finally creating more balance and experimentation in the medium by having plain mechanics and emphasizing the pleasures of exploration, choice, discovery, and interaction. Considering the market is flooded with shooters, platformers, and puzzle games (even of the indie variety), I am a big fan of this trend. However, Brothers does employ game mechanics in a very important way. It frustratingly requiring both brothers to be controlled simultaneously with only the player’s one rather limited brain and two analogue sticks, which of course grows to be strangely natural over the course of the game. Much as with the very successful Papers, Please, the design of Brothers embeds much of the meaning of the game directly in the gameplay. I will avoid spoiling the ending, but it is sufficient to say that when you get to it the game has a brilliant conclusion in large part due to the mechanics of the game. Furthermore, it also allows for a fairly unique sense of enjoyment with the game when you feel your control of the two character is truly synchronized. This strongly reminded me of the concept of “flow”, and how other well designed games such as Flower and Journey elicit it strongly. There are so many other things that are good in this game, and that are finally becoming more common in video games since the ongoing indie surge that has been happening at least since Braid and Limbo . Cutscenes are used sparingly, and correctly. The game as whole is short, which is to say the right length so no mechanics are tired out or pointless nonsense repetetive gamepaly is introduced. It is not sentimental, or childish, or simplistic (though whatever puzzles are in it are very intentionally simple). Forget specifics, the game as a whole is just uniquely beautiful. Play it, as soon as you can.